"Bonnie Christensen's heartwarming true story about Django Reinhardt, a Gypsy boy who became a famous jazz guitarist and overcame adversity, is written in lyrical prose. The inspiring story covers Django's birth in Belgium in 1910 and his family's nomadic lifestyle. Music, however, was a constant thread throughout his young life. After being abandoned by his father, Django moved to Paris where he played his banjo-guitar on street corners and in dance halls. In 1929, when he was nearly at the height of his career, tragedy struck and his left hand was badly burned. His prognosis was bleak and doctors thought that he would never be able to play the guitar again. But with unwavering fortitude and will, Django learned how to play using only the fingers on his left hand and made a triumphant return to the music world. Christensen's gorgeous impressionistic oil paintings and free verse text take students into the flamboyant world of gypsies in 1920 Paris. George Guidall's pleasing narration is accompanied by appropriate sound effects and beautiful jazz guitar music. An inspirational tale well told." Starred Review-"Jazz musician Django Reinhardt’s story is brilliantly told in Christensen’s 2009 picture book, packaged with a CD in this exceptional read-along. In calm, assured tones, Guidall reads the rhythmic verses, as violin, guitar, banjo, and other instruments form a musically enhanced backdrop. Sound effects, including barking dogs, ringing bells, and crying babies, set the mood for Django’s 1910 birth, in Belgium. Eventually, Django moves to Paris. “Still a boy he’s playing dance halls, fingers flying down the fretboard.” He grows musically and begins playing in clubs. And then, following a tragic fire in which two fingers of his left hand are rendered almost useless, it seems his career is over. Appropriately somber background music flavors Guidall’s reading of Django’s slow recovery. But “gradually he finds a new way” of playing and astounds the world as he tours Europe and comes to the U.S. in 1946. Haunting melodies accompany Guidall’s impeccable reading, and some prerecorded excerpts of original music (composed and/or performed by Django) elevate this superb title, enabling listeners to experience the musical legacy of this jazz legend and amazing artist. Christensen’s beautiful oil paintings enhance the rhythmic verses. The illustrations, text, Guidall’s reading, and memorable soundtrack contribute to a standout production. Guidall also reads the back material, including information about Django’s career, notes on the ethnic Roma people in Europe, a bibliography, and a discography." 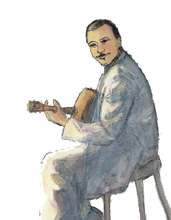 "Christensen's biography of Django Reinhardt brings this pioneer of jazz to life for young people. Through her poetry, Christensen chronicles Django's "hard life"-his birth in 1910, his abandonment and early musical days in Paris, his crippling accident, his rebirth and new form of jazz guitar, his musical alliances and tours. Narrator George Guidall combines reality and drama masterfully. He expertly delivers the syncopation of Christensen's text, and his use of andante and allegretto phrasing underscores both the specific events in Django's life and Christensen's poetry. Background sound effects and Django's own music add depth. Notes on the Roma people and a glossary and bibliography/discography conclude the production."